If you add these to the Padron Poppers recipe I posted a couple of days ago, you’re half way to a party! 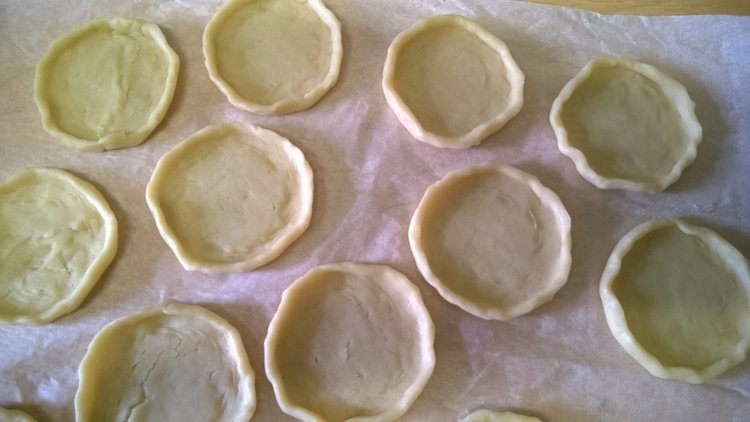 – Ready made ready rolled shortcrust pastry (or you could certainly make your own). – Jar of red pesto. – Pack of ready sliced cheddar. 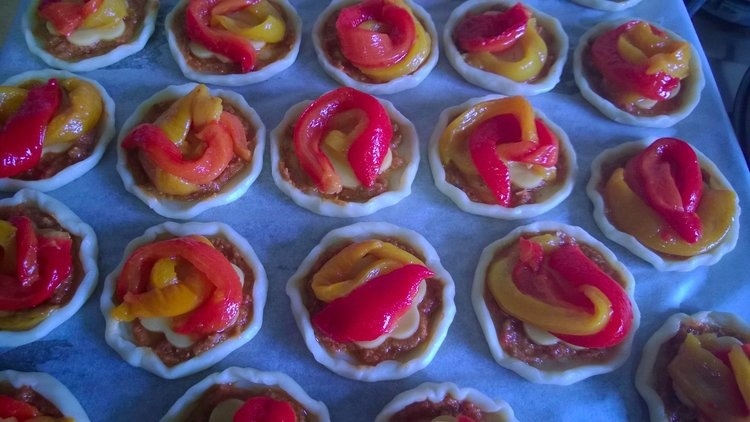 – Roasted peppers, I used red, yellow and orange, and I roasted my own. 1. Mix the pepper strips in olive oil until they are well covered, and then place them in a colander or sieve over a bowl to drain while you prepare the rest, give them a shake around every now and again so that as much oil and liquid drains out, they will retain a sheen of oil (if you bought ready roasted peppers that were already in oil, then no need to re-oil them, just drain them). 3. Spread each one with pesto. 4. Cut circles out of the cheddar a little smaller than your tartlet circles and place one on each tartlet. There’s no reason at all to use a flower shaped cutter for the cheese like I did, it’s just that was the only one I had that was the size I wanted! 5. Drape a couple of strips of the drained peppers over each one. 6. 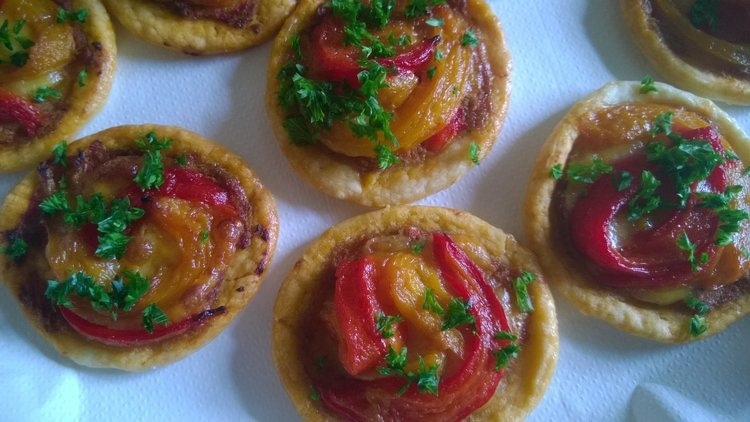 Brush some beaten egg on the exposed edges of pastry around each tartlet. 7. Bake them on a baking sheet (I lined mine with baking paper first) at 180C/350F, until you can see the pastry around the edges has turned a lovely golden colour. I’m afraid I forgot to time mine, but I think it was somewhere between 15-20 mins. 8. Leave to cool a little on racks. 9. When you’re ready to serve them, finely chop the parsley and sprinkle over. Very visually appealing. The flower shaped cheese is so cute! It’s cute, but makes no difference to the end result! I had breakfast quite a while ago, and this is almost a little painful to see at because they look so yummy. Drool. The colours are good aren’t they, I like colourful food! These are saved for my next function or potluck. Quick, easy and sooo visually pleasing. ❤ Thanks, Vanessa. Yep, it’s good to have some recipes like this up your sleeve that pretty much can’t go wrong (unless you forget them in the oven! ), and look quite impressive. 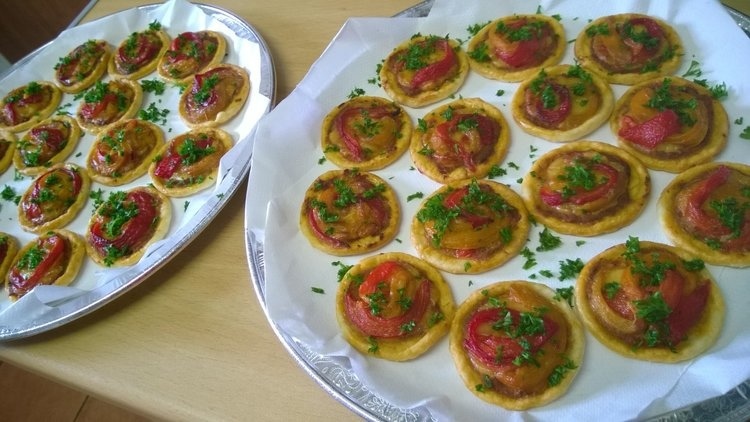 It was a kind of potluck that these were made for actually – Neil was going to a sort of working lunch thing where everyone was bringing something to share, so I knocked these together for him to take. He said they went down well because everyone else had just brought bought stuff in packets, so everyone was impressed with his contribution! You’re a HIT, Vanessa. Yay to your wisdom and loving help. I’m half way to a party? … I like parties! You’re too late now, party’s over! I know! I need to create another recipe now where the cheese shapes can be more visible! Those really are adorable. What a fun appetizer. Or throw a salad on the side and call it lunch! This looks very attractive. 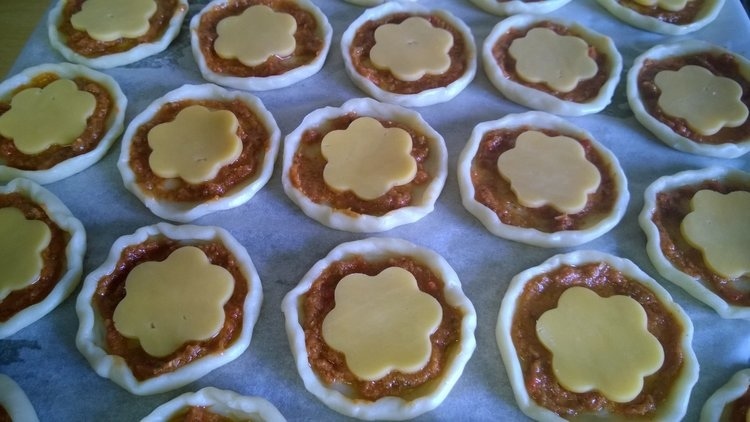 How do you feel about buy the tart shells with pastry. Cheating perhaps? Excellent. I actually used to have a baking business Vanessa ( small known fact) and frankly it made me detest the kitchen. I definitely can make pastry just don’t like to. What’s this news?! Ah ok, you’ve had enough then! I don’t think I would like to do cooking of any sort for a job, it would stop being fun then I’m sure.